The fact Amazing Spider Net - Daily News, often we are afraid if they find this animal, but in fact these animals are not dangerous and scary. The spider made a web released by the body to his residence. Interestingly, the nets are removed the spider is more potent than natural or synthetic fiber on the Earth. According to evolutionary zoology expert University of Aarhus in Denmark and Expert Cobwebs, Fritz Vollrath concluded that the spider web is stronger, elastic and durable than the strongest man-made fiber used to make bulletproof vests. 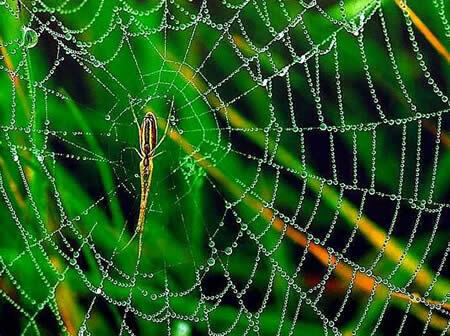 Cobwebs are very flexible and able to stretch up to 140% without damaging the net. For this material, cobwebs, including lightweight materials. That is because the protein fibers of spider (Gossamer) is very high and has many functions such as to catch insects, protecting the nest, even to eat. Scientists have been trying to understand the mechanism of spiders in webs, but so far failed because of the complex molecules of proteins and repetitive DNA sequences in the spider. Even so, the scientists managed to conclude on how the spider web to harden. Vollrath said that the spider webs in a way mengasamkannya harden and methods are similar to the manufacture of fiber in the industry. Before entering the channel, spider webs consisting of liquid protein. When the fluid entrance channel, the cells draw water out of the net protein and hydrogen is pumped into the other channel and that's what caused the acid bath. Cobwebs and then spun from the gel into a solid fiber is drawn through the acid glands of spiders called the gland spinneret. The spider has a 2-8 spinneret, and usually in pairs, depending on the species. Spinneret issue various types of nets, of which that is not sticky to sticky, depending on needs.